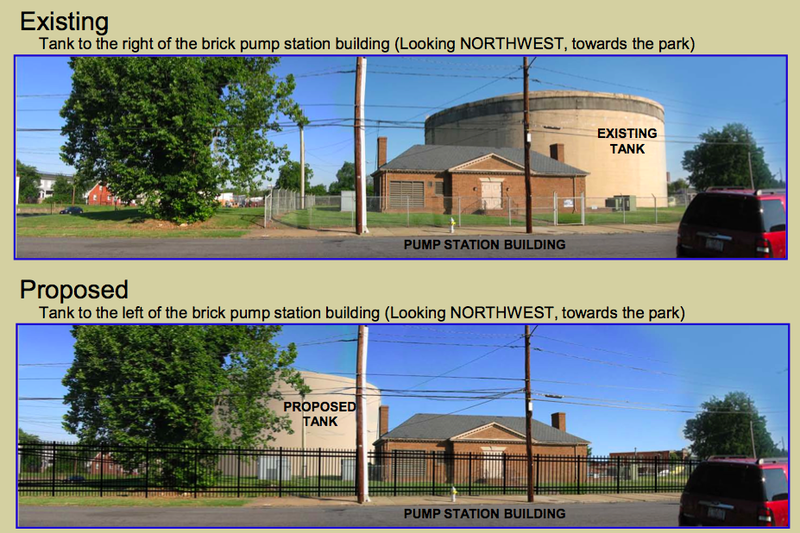 The Department of Public Utilities (DPU) is proposing to replace the existing Church Hill Water Storage Tank located at 714 North 30th Street (between 29th and 30th and M and N Streets). Attached is a brief summary concerning the project and replies to “Frequently Asked Questions” about the project. (PDF) The existing Church Hill Tank is approximately 58 years old and is used to store drinking water, which is then distributed to the Church Hill service area through the Church Hill Pump Station at the same location. Conceptual design of the replacement tank is on-going. DPU staff and Greeley and Hansen staff would be delighted to meet with your neighborhood group to make a presentation on the proposed project and to answer questions posed by the group. If the group is interested in a presentation, please let us know your preferred dates, time, and venue for the presentation. For your information, we are currently scheduled to make a presentation to the Church Hill Association at St. Johns Church on September 18, 2012. This meeting is scheduled to begin at 7:00 PM. Members of your group interested in the project may wish to attend the meeting on the 18th. If you have any questions concerning the proposed tank replacement project, please call me at normal business hours at the number listed below (804/204-2411). You may also contact DPU’s Project Manager, Ms Janice Bailey (804/646-8448). Why not keep the old one in place as a swimming pool? FWIW, I think it looks much better on the right side and really hope they add a stripe to the top of the new one like the current one has. Thanks for the contact info, John. I will call them and ask about a mural for the water tower. Would love to see some great art on this huge 360-degree canvas! Excellent ideas, Elaine & Magneto! I know there has got to be a way to do a mural or find another color of paint than Richmond Barf-Brown. Nice ideas but here should be input from the folks in the immediate neighborhood that have to look at this thing everyday as opposed to those of us who might infrequently drive by it. I think it would be cool to have a mural that started with an image of Church Hill during the time of Powhatan and progressed to the present as it went around the tower. 2) Provide metal fencing along M Street to help define the area allocated towards the water tank use and provide security to the site. The fence should be consistent around the entire water tower property. 3) If we can make a go of the green wall concept, I think this would be a creative way of “hiding” the new tank. Just some ideas I plan on pitching to the consultants. I have thought for years that this water tower could win the ugliest spot in Richmond contest if we had one. I would love to see it replaced. I would love to see it look like a place we would desire to go picnic at in some way, not the sight it is now. We as well are in the area that faces this water tower everyday. It is embarrassing so I am so glad that they are trying to do something about it.